Take that, E-ZPass! Victory is mine! – Pamela Wood. Take that, E-ZPass! Victory is mine! Regular readers of my little ol’ blog may recall that about a month ago, I had a horrible, rainy morning that involved having to go through the Harbor Tunnel toll plaza on my way to work. I didn’t have the cash to pay the toll, but I paid it online. 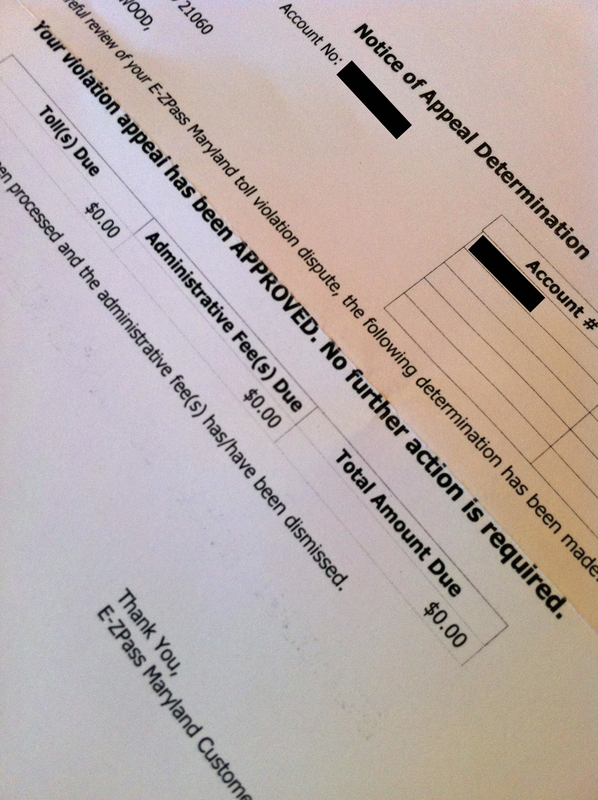 Then, a few weeks later, I got a bill in the mail from E-ZPass for the $2 toll, plus a $3 charge. Needless to say, I was livid. So I gathered my evidence and sent a firm letter telling E-ZPass just how wrong they were. Your violation appeal has been APPROVED. No further action is required. Your toll payment has been processed and the administrative fee(s) has/have been dismissed. Not surprisingly, E-ZPass wasted paper and actually sent me two letters — one copy for my records and one copy to submit with my payment. You know, my payment for $0. Good grief! But hey, at least I got The Man to correct a mistake. I’ll take that. Previous postHappy Birthday, Maryland Gazette! Next postO’Malley the TV reporter? It is the little victories that count! Congrats!